By Dr J.F.R.Day Coat of Arms no 190 summer 2000. I have some minor quibbles over how impersonal the standard and banner were – a banner is in a sense “personal” to a nobleman of rank since its very size and shape indicate a peer’s rank.9 Still, I think James has made a telling point, one often overlooked by scholars looking for more modern or even postmodern explanations. The original theological justification for the heraldic funeral was absolutely individual and religious – the association of the dead man’s personal insignia with the Offertory of the Mass was itself a symbolic way of applying the efficacy of the prayers for the dead directly on behalf of the deceased. Once the Requiem Mass became simply the Burial of the Dead, the elaborate choreography of the Offering that the heralds supervised no longer has much if any religious significance. 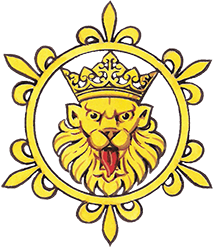 After the Elizabethan Settlement, the eventual replacement of wax hearses by heraldic hearses, the exchange of saints’ banners for armorial insignia, at the “Offertory” of what was no longer a Requiem Mass strike me as making a major contribution to the eventual decline of heraldic funerals. While both Elizabeth and Burghley saw them as political and social desiderata, the Protestant view of funerals was surely undercutting any religious use of heraldic symbolism – not merely because of the Reformers’ direct attacks but also because of the emphasis of these rituals was being completely changed. For Reformed Englishmen like Archbishop Sandys and John Weaver, funerals were not for the dead but were instead to comfort the living.13 One need not postulate a “rise of the individual” to realize that the purpose of Roman Catholic Requiem Masses was very much concerned with the dead themselves, not merely their survivors. Thus as the Offertory at the heraldic funeral lost half of its value even as consolation. In short, whatever one does with theoretical constructs like increasing individualism to explain the decline of heraldic funerals, one must add to exorbitant expense an increasing Puritanism at least one other cause. Rather as Aubrey wonders if the coffin used at Sir Philip Sidney’s funeral was empty and simply there for show, the religious assumptions behind the heraldic funeral seem to have become a sham. With no Requiem Mass, the Offertory becomes nothing more than an investiture ceremony for the heir. Family pride might well continue to dictate elaborate deference for the deceased in Stuart England, if in increasingly private displays. But the panoply of the heraldic funeral, associated as it was with the prayers for the dead in the Roman Requiem, must have appeared increasingly unnecessary in this world, since for a Protestant England, it would seem to have nothing to do with the next. Along with the illustrations from College of Arms MSS in my article in Tudor Political Culture, see the illustration of Sir Philip Sidney’s coffin showing his arms in Elegies for Sir Philip Sidney, ed. A.J. Colaianne and W.L. Godshalk (Delmar, NY, 1980) n.p. For an idea of the frequency of these funerals, see Henry Machyn, The Diary of Henry Machyn, Citizen and Merchant-Taylor of London, ed. John Gough Nichols (London. 1848). Machyn, though not a Herald, was involved with heraldic funerals, and his account is most interesting. For example, there are at least forty-five heraldic funerals Machyn lists for 1559 alone, pp. 184-221. I am grateful to Professor Norman Jones for first putting me in mind of Machyn. Another indicator, the Calendar to the two-volume College of Arms MS “Dethick’s Funerals, ” lists on the order of 120 heraldic funerals mainly of peers between 1586 and 1603. Litten, English Way of Death, 161. British Library Add. MS 23.747, fol. 27. Linda Levy Peck in her Northampton, Patronage and Policy at the court of James I (London, 1982) 157, points out that aside from his lively concern to curb the heralds’ excesses as commissioner for the office of Earl Marshal under James I, the earl of Northampton had also served on the commission to investigate the abuses of Sir William Dethick, Garter, under Elizabeth, so his involvement with the heralds was a long-standing one – as might well be expected from a Howard who would have a strong family interest in the office of Earl Marshal, the great officer of state to whom the heralds answered. Mervyn James. “Two Tudor Funerals.” in Society, Politics, and Culture: Studies in Early Modern England (Cambridge, 1986) ,176. John Brooke-Little, Royal Ceremonies of State (London, 1980) 105-6. See Gittings, Death, ch. 8. Sidney Anglo, Images of Tudor Kingship, 102, describes this part of Henry VII’s funeral as a “climax which was more heraldic than liturgical,” though there was still a liturgical point being made. James, “Two Tudor Funerals.” 180. Machyn notes these banners in his list of funerals in 1559, as that of “Dr Koke of the Arches.” 187, and the marchioness of Winchester, 187-8. Interestingly, there are also indications of funeral Communion services in Machyn after Elizabeth’s accession, and the English obsequies held for Henri II in 1559 included Communion: College of Arms MS S.M.L. 29. “Ceremonials II.” p. 291. Undoubtedly the issuance of the Elizabethan Book of Common Prayer, with no Communion at the Burial of the Dead, ended this practice. Anglo, Images, 101, 103. In BL MS Cotton Julius B. XII, fol. 7v there is “The Ordering of A Funerall for a Noble person in Hen. 7. time,” which indicates that the banners of the Trinity, Our Lady, and St George (for England) were used for every defunct nobleman, along with his heraldic flags. It is easy to see that these flags would cover just about all the theological bases for a pre-Reformation Christian. Machyn, Diary, xxix, defines a “wax hearse” as a frame covered with candles built to receive the body in church. It is clear that wax hearses were also used on the Continent: a painted funeral roll in the College of Arms. 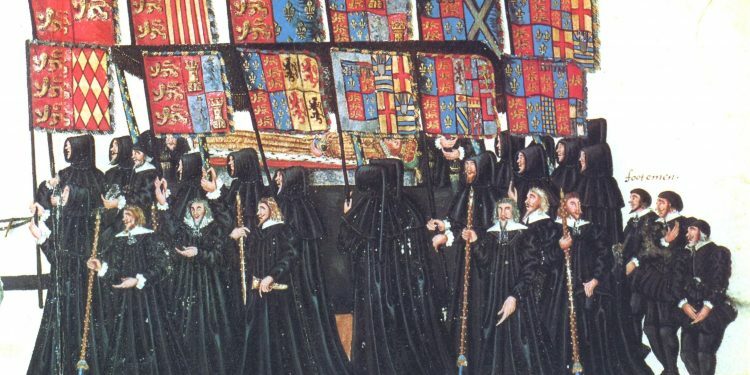 London, showing the obsequies for Charles V held in the Lowlands depicts such a hearse, and Litten, English Way of Death, 11, shows a contemporary drawing of the elaborate wax hearse built in 1532 for Abbot Islip in Westminster Abbey. The wax hearse is clearly more “old religion” than the heraldic hearse unadorned with candles: the wax hearse seem to fall out of favor after Elizabeth’s accession as the purely heraldic version becomes standard for the gentry and aristocracy. Davis Cressy. “Death and the Social Order: The Funerary Preferences of Elizabethan Gentlemen.” Continuity and Change 5.1 (1989) 99.